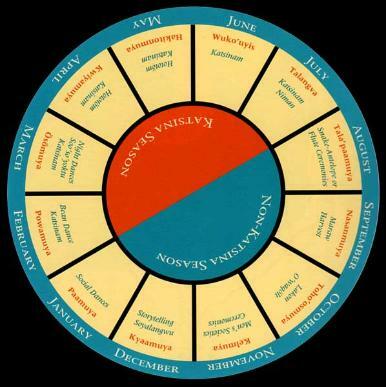 The Hopi religious calendar begins anew each year in November with the Kelmuya season. Only those who have been initiated into "manhood"
may participate in the ceremonies, which celebrate the creation of our present world, the Fourth World. prayers, fasting and eating sacred foods. Once the rituals have been completed, people begin preparing for the winter social dances. wildness we have in ourselves in order to prepare for the solemn religious ceremony that follows in February. begins when a katsina high priest—the Ahöla—comes at sunrise to bless all the houses. He "opens" the kiva so that the divine katsinam will visit. with yucca branches as their weapons. In a severe case of disobedience, the jumping cholla cactus might be used. special blessing is given to everyone by the kiva men and a social dance is held to heal things. The ogre family is forced out of the village. during the Night Dance season, which lasts from now until some time in July. kiva and go on to the next kiva, and then a new group arrives. The dance series may go on until just before dawn. It is usually windy and cold. scheduled around the planting of crops. Katsina day dances are held from March through June. people and encourage them to train for the tough races that are an important part of the activities that will come up in the ritual cycle. Pöma'uyis (early planting) is the season for planting Hopi indigenous beans (morivosi), called hatikou. They are red and yellow beans. weather. Some of the main Katsina dance events, which focus on the bringing of rain for the sprouting of crops, are also happening. and are treated the same as their children. They live with the families in the village. hear the Katsina songs coming from the kivas. Initiated men visit the kivas to smoke ceremonially and pray for rain and a plentiful harvest. plenty of moisture. The katsinam dance and are served sacred foods and give gifts of food—samples of the coming harvest—to the people. there is a sponsor. At sunset the following day the people reluctantly watch as the katsinam head home to their spirit world. here among the mortals, and it is now up to other spiritual forces to assist in the livelihood of the people. Water Clans. These events reach their climax in the Snake-Antelope Dance Ceremony or the Flute Ceremony, which are held on alternate years. They are performed to bring the last rains of the summer for the growing crops, for a good harvest and to prepare the fields for the next season. After that, boys and girls come to the plazas for many social dances, including the Butterfly Dance, to celebrate good crops and a good summer. ceremonies, but they are public expressions of gratitude for plentiful food and a good life. women's society) blesses the harvest season. Men who have been initiated into the Maraw society perform with them. and O'waqölt, which are Basket Dances. These dances serve as meditations for fertility and maternal happiness. Both use basket weavings. endurance and also to announce the time for deer and antelope hunting. ceremonial calendar will soon begin.